While individual patients with orthostatic hypotension due to autonomic failure had described improvement in upright blood pressure and functional capacity following ingestion of water, there was limited support for this concept based on current understanding of human physiology. We examined the effect of oral ingestion of water in patients with two forms of autonomic failure, pure autonomic failure (PAF) and multiple system atrophy (MSA) (Jordan et al 1999, 2000a,b). PAF and MSA patients often have severe autonomic dysfunction, but the site of pathophysiology is distinct. In PAF, there is loss of peripheral autonomic neuronal fibres, so that the intact CNS control mechanisms lack the peripheral 'wiring' needed to effect changes in autonomic outflow. In contrast, in patients with MSA, the autonomic failure is not so much characterized by destruction of peripheral sympathetic and parasympathetic nerves, but rather by a failure ofCNS mechanisms to appropriately engage the largely intact peripheral autonomic innervation. FIG. 4. In a population of patients with autonomic impairment, the ingestion of water (16 ounces; 473 ml) elicited an increase in systolic blood pressure of about 40 mmHg within 20 minutes. The diastolic pressure increment was about half that. Note that most of the effects of the water ingestion are dissipated within 90 minutes. 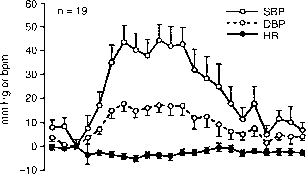 effects of dietary Na+ on arterial pressure, and even this remained controversial. It was therefore unexpected when under controlled conditions we did indeed observe a substantial effect of water on blood pressure in autonomic failure patients. Water was given to PAF and MSA patients in a dosage of 16 ounces (473 ml), ingested fairly rapidly over a period of 2—3 minutes (Fig. 4). In response to this, blood pressure became detectably higher within 10 minutes and climbed to a maximal pressure increase of about 40—50 mmHg at approximately 25 minutes following ingestion (Robertson et al 2001). After that pressor effect, a gradual decline occurred that brought blood pressure back to baseline over the next 45 minutes. While some patients had responses smaller than 30 mmHg, in others blood pressure rose more than 90 mmHg. The magnitude of this response was astonishing. Indeed, it was greater than that observed with commonly used doses of any pressor drug in autonomic failure. The effect was most dramatic in the supine posture but was also present in the seated and upright postures and translated into a significant increase also in the standing blood pressure and functional capacity. FIG. 5. Effect of oral water (480 ml) on blood pressure and heart rate in healthy older controls. 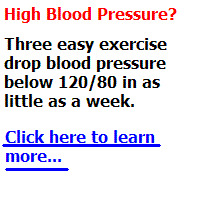 A mean increment of 10 mmHg in systolic blood pressure is noted. replicated in normal individuals. Using a similar protocol in healthy young subjects the pressor effect of water was not observed, although a significant increase in plasma noradrenaline was seen. In contrast, water administration in older normal subjects elicited a significant and reproducible mean increase in blood pressure of 11 mmHg (Fig. 5). In the older patients this pressor effect was accompanied by a trend toward reduced heart rate, but this did not reach statistical significance. To address the mechanism of this unexpected effect of water, trimetaphan was administered to determine if the effect was dependent on the integrity of autonomic function. In the presence of trimetaphan, no effect of water on blood pressure was observed. This suggests that the pressor effect is dependent on a degree of integrity of the autonomic nervous system for expression (Jordan et al 2000b, Rossi et al 1998). 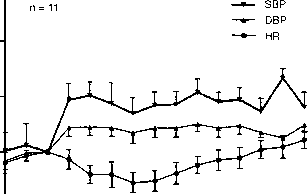 In this regard it is noteworthy that even in severe disorders of autonomic dysfunction, some level of autonomic function remains characteristic, and, in the absence of the buffering capacity of a fully functioning baroreflex, autonomic pressor and depressor reflexes can be surprisingly strong. To determine whether oral administration was crucial, we gave a comparable volume of 5% dextrose solution intravenously. This agent was selected because the hypotonicity of water itself would be harmful if administered parenterally, and use of physiological saline would add the confounding variable of Na+ to the study. The 5% dextrose did not replicate the pressor effect of oral water. The temperature of oral water might be related to its pressor effect. To test this possibility, administration of cold (4 °C) and warm (37 °C) were compared. They were effective to the same degree as water at room temperature. These data suggest that sympathetic activation is somehow elicited by oral water but that this is most dramatically manifest with impairment in central autonomic control as in the case of MSA. It is remarkable that this effect of water had been missed by physicians for so many years, but we were probably so influenced by our physiology training that we could not see this striking anomaly. However, once recognized, the effect of water has proven to be a significant therapeutic advance. Its value vis-a-vis other drugs lies in the potency of its action, the lack of major side effects, the rapidity of its onset and, since supine hypertension is often a limiting factor in therapy ofpatients with MSA, the relatively fast return of blood pressure to normal. The depressor effect of food, especially carbohydrate, has long been recognized in MSA. 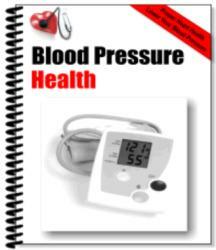 Now with recognition of the pressor effect of water, a simple and patient-controlled approach to blood pressure management is possible. Our experience so far suggests that many patients need no other therapy for control of blood pressure than judicious dosing of food and water. Careful further studies will be required in order to elucidate the precise mechanism underlying the effect of water, but an action through gastrointestinal stretch receptors or osmoreceptors must be addressed in future investigations. There remains the possibility that subtle blood volume increases in the hour after water ingestion, and before it is fully compensated by effects of the vasopressin/renal system, might contribute to this effect. For the older normal subjects, the importance of the pressor effect of water is the noise it adds to the monitoring of blood pressure. Until now recent water intake has not been a variable controlled in studies ofblood pressure and antihypertensive agents in the older age group. It would now appear that water ingestion may represent a major component of the noise inherent in blood pressure monitoring in this population. Recognition of this effect and control for it may reduce the number of subjects needed in future studies of antihypertensive drugs.